Sometimes, it’s Friday night and you have an awesome dinner plan that includes chicken tikka masala and a spiced basmati rice… AND THEN your husband reminds you that it’s Lent. No meat, sister. Plan B? Ask the kids for ideas. Waffles? Why not? Chocolate waffles? Even better. Chocolate chocolate chip waffles? Yes, ma’am!! These chocolate chocolate chip waffles were ridiculously good. I don’t necessarily recommend you eat them for dinner, but I won’t judge if you do. Chocolate waffles would be amazing, of course, for breakfast or even dessert topped with fresh fruit or ice cream. Stop the madness. Let me get to recipe … You need to make these very soon. Our first batch didn’t have enough sugar or milk but they were still pretty awesome. We upped our milk and our sugar and I think we achieved chocolate chocolate chip waffle perfection. If you like your waffles a little on the sweeter side, you might want a bit more sugar. The batter will be thick – you can thin it out a little bit more with a bit more milk. An extra splash or two should be fine but not much more than that. These waffles would be great for breakfast ... or dessert! In a large bowl, combine dry ingredients including cocoa powder and sugar. In a medium bowl, whisk together eggs, milk, vanilla extract and melted butter. Add egg and milk mixture to dry ingredients. Stir to combine. Add mini chocolate chips. Stir. Ladle batter into waffle maker. Cook until steam stops coming from the sides and waffles are easily removed. OOHHH!!! Homemade whipped cream! YES to that. I have been mainly dairy-free with nursing the baby – can’t believe I forgot about homemade whipped cream. Really, that would be perfect. Chocolate chocolate!! Well I’m all over these! The more chocolate the better! Thanks, Kacey! That is so kind of you to say! It’s hard to say no to that! We generally do the breakfast for dinner nights when my husband isn’t coming home… I am not sure mine would be on board! Love that! Thanks, Brandy!! Yes, you would be queen!!! 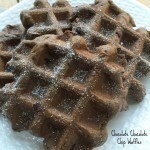 I love chocolate and I love waffles, but I’ve never tried them together. This is a must-try recipie. Thanks, Justin! I have to say this was our first chocolate waffle adventure and we can’t believe we’ve been missing out for so long! I would never turn down chocolate waffles for dinner! These look delicious! Yum! Can’t wait to try this! My husband prefers gluten-free food.